HILLSIDE, NJ – May 30, 2014 - NECA/WizKids is excited to announce a new Dice Masters game set in the Dungeons & Dragons Forgotten Realms universe. "We're excited to expand our Dungeons & Dragons portfolio with the addition of Dungeons & Dragons Dice Masters. Dice Masters is an all new game that utilizes WizKids Games' proprietary Dice Building Game platform where players collect and assemble their "party" of adventurer dice and battle in head to head gameplay. Dice Masters has had huge initial success, is a very exciting platform and should fit perfectly with the world and lore of Dungeons & Dragons. You can expect to see some of the most recognizable monsters and characters, such as Kobolds, Beholders, Mindflayers, Dragons, Drow, and many more!" said Justin Ziran, president of WizKids Games. "We're excited to work with Mike Elliott and Eric M. Lang, who brought the original Dice Masters game to life, and we are sure they will bring Dungeons & Dragons Dice Masters to the table top in unique and immersive ways." 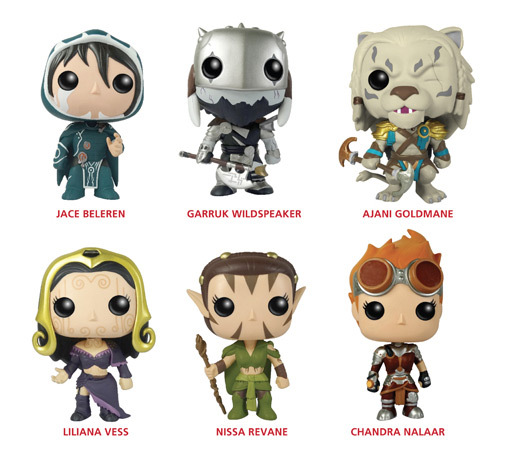 LYNNWOOD, WA – February 16, 2014 – Funko is excited to announce a new licensing agreement with Wizards of the Coast, Inc., a subsidiary of Hasbro, Inc. (NYSE: HAS) to produce Magic: The Gathering Planeswalker figures for their popular Pop! Vinyl Figures and new Legacy Collection Action Figures lines. "We are deeply honored and very excited that Wizards of the Coast chose Funko as a partner to develop truly cool collectibles for Magic: The Gathering. I know the fans of Magic have been waiting nearly 20 years to get their hands on some fantastic Action Figures and stylized Vinyl figures. I promise that we won't disappoint them!" said Brian Mariotti, CEO of Funko.